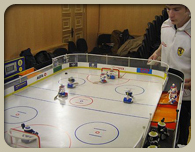 World Table Hockey Association adopted and fully supports the RTHA (RTHA is member and official partner of WTHA in Russia) multitable idea – the idea of table hockey multicontest. 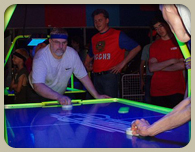 Since the 1st World billiard-hockey Championship WTHA have planned to organise multitable championship and to find best all-around table hockey players. The idea comes true in May 2008! 2nd World billiard Championship will be completed with 1st World multitable Championship ! What are the bases of the multitable idea? What disciplines are part of multitable championship? 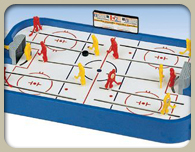 The other types of table hockey still should join the event – as presentation, associated tournament etc. How to join the championship? How are the disciplines counted together? We expact that all participants will join all disciplines/standards - by the way, that is the basic idea of multitable. The team should be however specializes for each discipline. To count the disciplines WTHA uses the own point tables. Results from all disciplines/standards *) are summed together. The points are counted in three categories - men, juniors U18 and ladies. All participants of multitable championship participating at billiard-hockey and air-hockey Czech Open will be given bonus 30 points (independently of the results in these tournaments). The more points, the better. (WTHA Tour decisive criterions are used for equal points situations). Results from all disciplines/standards *) are summed together. The places in team competitions are counted together. It means the best team is given 1 point, second 2 points, etc. If the team does participate at any of disciplines, it is given as much points as last participating team + 1. The less points, the better. (WTHA Tour decisive criterions are used for equal points situations). *) Only the best results from three Rod hockey games (Luch x Chemoplast x Stiga) is counted the the final sum.